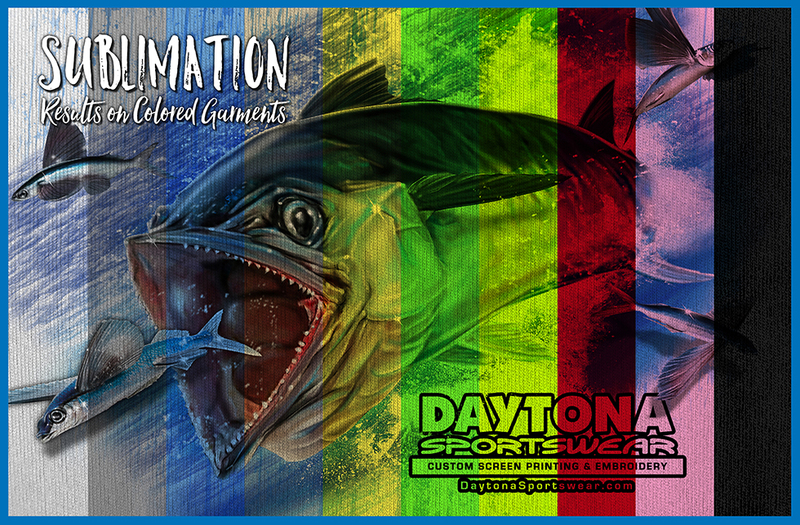 Now Offering Dye Sublimated Products and Apparel. This is one of the latest forms of permanent printing, and involved printing to a special treated paper and transfer that image to your garment or product through the use of high heat and pressure. This process turns the ink from a solid dye into to a transferble gas, dying the garment. It is recommended however, that because there is currently no way to print white with this process, that in order to retain and exhibit full vibrancy of your design, that only light colored garments be used. 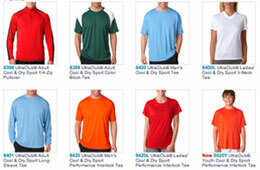 The example below illustrates how a colored print would tranfer to various colors of "sublimation ready" fabrics. Please note: White in the design would become the shirt color and design colors may be effected by the shirt color they mix with. More Information Coming Soon! Stay tuned or call for details.